Native’s son brings promised movie premiere to Elizabethtown, Ky.
ELIZABETHTOWN – It’s close to 11 a.m., and the Back Home Restaurant is ready to open its doors. But first, 20-year-old Hali Cox and 47-year-old Karin Hart, who will both work at the restaurant today, have to go outside. They want a glimpse – just a taste – of what’s going on past the restaurant’s front door. There, along Highway 31W – the town’s main road – hundreds line the street to wait and watch. They hold signs. They wave banners. Some of them scream. “It’s so cool,” Cox says. 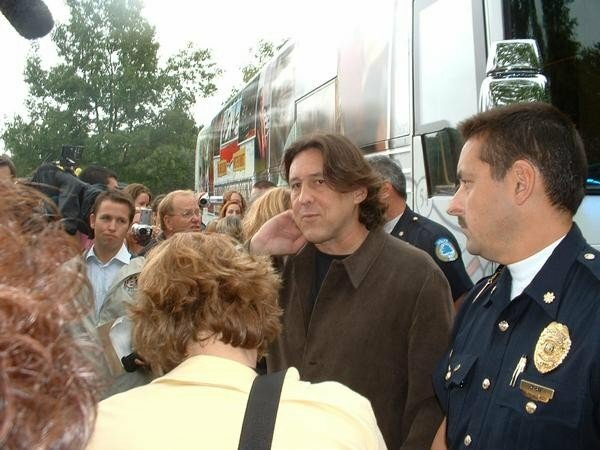 Like the name of Hart’s restaurant, Cameron Crowe is back home. To be more precise, the director of films like “Almost Famous” and “Jerry Maguire” is back in his father’s home. Crowe’s father served at Fort Knox and grew up in Powell County in eastern Kentucky. The director still has family in Lexington and Louisville. And, when it came time for Crowe to make another movie, his mind drifted back to his childhood, of the stories of his father in Kentucky. Behold, “Elizabethtown,” the director’s latest film, slated for nationwide release Oct. 14. Starring Orlando Bloom, Kirsten Dunst and Susan Sarandon, the movie follows a tennis shoe designer (Bloom) as he becomes a monumental financial failure. And when his father dies, he is forced to leave his home in Oregon and travel to Kentucky for the memorial service. During the filming Crowe promised local officials he would have the worldwide premiere in Elizabethtown. On Saturday, he kept his promise, showing the film to about 230 invited guests in a special sneak-peek party. “I told everyone I would bring (the movie) back,” Crowe told spectators at a picnic in a local park Saturday. The town, 45 minutes south of Louisville, boasts a population of 24,000, and spans 24 square miles. And while only one day of actual filming occurred in the town – filming also was done in Winchester, Louisville and Versailles – most here say the movie is the biggest thing to happen since the Civil War. Saturday, it was all anyone could talk about. Even Rabbit Hash has its own movie. But Elizabethtown – known as E-town to the locals – has never seen anything like this. On one side of a street, Elizabethtown native Cathy Basham sits in a lawn chair with her three shih tzus and her 12-year-old daughter, Ashley, who has a life-sized cutout of Bloom in his elf costume from the “Lord of the Rings” trilogy. Bloom’s face is smudged with lip gloss from the number of times Ashley has kissed it. But those expecting to see Bloom were disappointed Saturday. Shooting for Bloom’s next movie, the sequel to “Pirates of the Caribbean,” went a day too long, which forced him to miss the premiere. Spokespeople said he was scheduled to appear at a later premiere in Louisville on Saturday night. Bloom called the Elizabethtown crowd from his cell phone, where he apologized through a loudspeaker. Still, neither the absence of Bloom, nor the gray, cloudy weather could spoil Elizabethtown’s day in the sun. Locals emphasized that the movie is not only about one place, but that it represents the entire state. “This is a huge day for Elizabethtown and a huge day for Kentucky,” says Sherry Murphy, who works with the town’s Tourism and Convention Bureau. Murphy said the bureau is already working with the movie’s distributor, Paramount Pictures, to create a tour of the places visited in the film. Certainly some of the locals who appear in the film will take the opportunity to share their newfound acting knowledge. E. Russell Marlowe, who works for the town’s chapter of the Veterans of Foreign Wars, plays himself in the movie. Crowe says it is that realness that makes the state and the movie so special to him. Most people felt the director would not stereotype Southerners, but instead deliver an accurate portrait of small-town life in Kentucky. Before Saturday’s premiere, 10 residents who came up with the most creative signs were awarded passes to the premiere. Amy Thomas, a 24-year-old from Elizabethtown, decorated a bedsheet displaying her love for the town and the movie. She got in. Fourteen-year-old Candace Hagan, of Cincinnati, came to Elizabethtown, where her grandmother lives, to watch the premiere. “I just wanted to see Orlando’s new movie before anyone else did,” she says. And from the early reviews, the town is not disappointed. Cheering and clapping whenever a familiar place or face was seen, the crowd loved every minute. “I think it was a real nice symbol for the town and for the state,” says Tom Renfrow, 55. Crowe says the movie is personal to him. “This place, this area casts a bit of a spell over you,” he says.